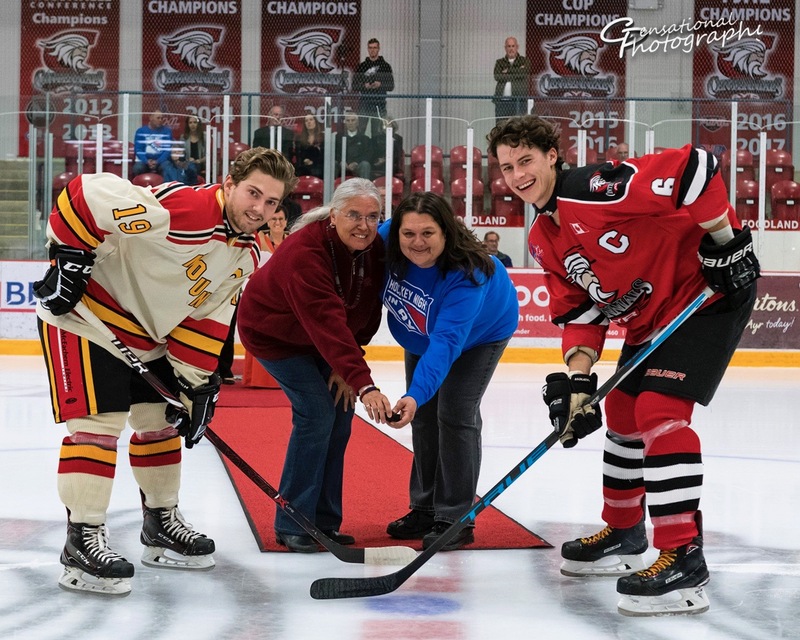 Puckdrop: Chief Ava Hill of the Six Nations of the Grand River (centre left) joins (centre right) Christine Pritchard, Buddy Maracle’s great-great-niece, in a ceremonial face-off last week in Ayr, Ontario. Left is Paris Mounties’ captain Alex Ritchie with Nolan Ferris of the Ayr Centennials. The NHL continues to show scant interest in Buddy Maracle’s story, but the man who seems to have been the NHL’s Indigenous player is making more and more of an impression in the southwestern Ontario from whence he skated. Born in Ayr, Ontario, in 1904, Maracle, who was Oneida Mohawk, played briefly for the New York Rangers in 1931. By the time he died in 1958, hockey history had all but forgotten his achievement, and the forgetting mostly endured until earlier this year. Following up on a summertime ceremony, the town of Ayr last week recognized Maracle with an on-ice ceremony ahead of a Junior C game between the hometown Ayr Centennials and the Paris Mounties. 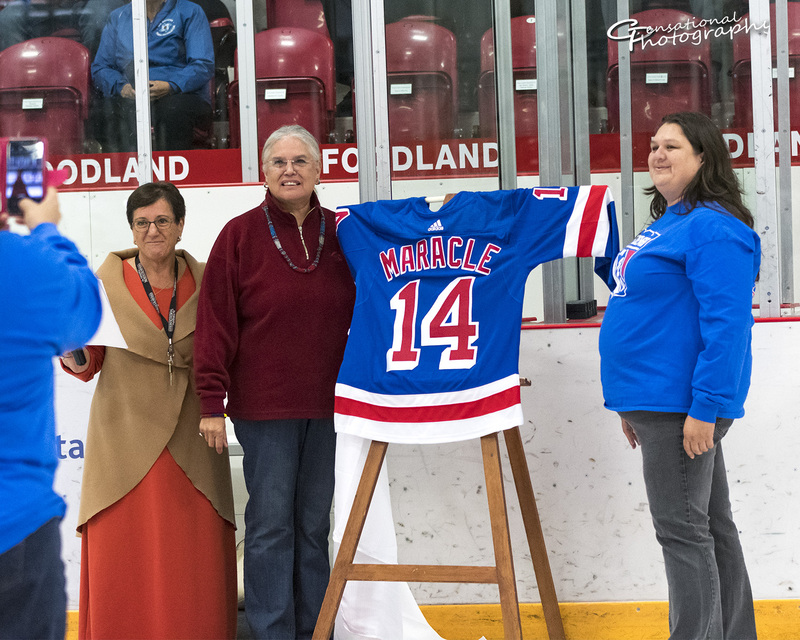 As of last week, the New York Rangers had no immediate plans to recognize Maracle’s achievement, but the team did donate two (modern-day) team sweaters bearing Maracle’s name and number 14. In June, Mayor Sue Foxton of the Township of North Dumfries presented one of these to Terry General, a councillor representing the nearby Six Nations of the Grand River. Last week’s ceremony saw Mayor Foxton and Six Nations Chief Ava Hill unveil the second sweater before the puck dropped at the North Dumfries Community Centre. Also taking part was Maracle’s great-great-niece Christine Pritchard and other members of the Maracle family. The sweater will be on permanent display at the North Dumfries rink. With the puck in play, Ayr prevailed, for the record, edging Paris by a score of 2-1. Sweater Weather: Unveiling Buddy Maracle’s number 14 in Ranger blue are (from left) North Dumfries Township Mayor Sue Foxton; Six Nations’ Chief Ava Hill; and Christine Pritchard.